I visited Jim McVicker a second time in the Eureka-Arcata area back in the mid-1990s, when I flew up there to spend some time with him and Terry Oats at their home, after which we drove together down to San Francisco, where Jim had an exhibition for which I wrote the catalogue copy. 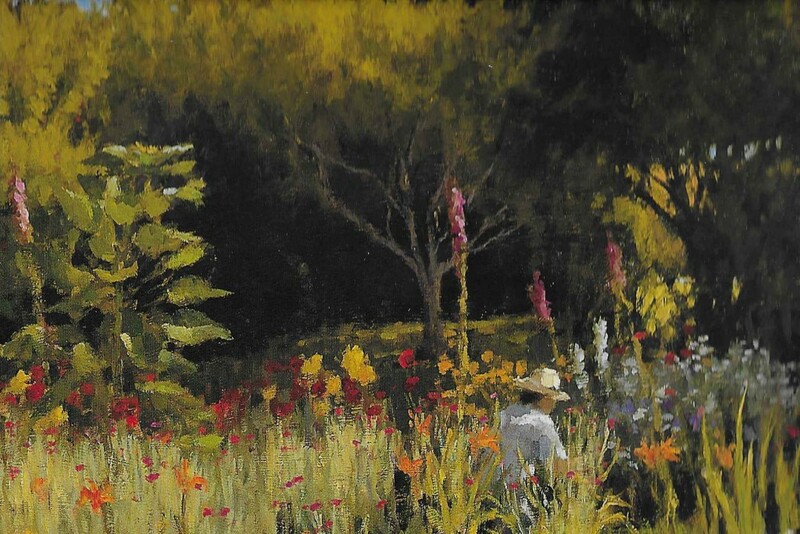 While I was visiting, Jim began working on a painting of their garden, and I suggested that it might work better if he had a figure kneeling at work in the midst of the flowers. I walked along the garden path, crouching at various points, until Jim said, “Stop there.” It was a warm day, but I had a hat on, and the fragrant poise of his garden’s flowers helped me hold a pose long enough for him to render a symbolic votive centered in an enduring cycle of renewal.